Our camp and guide services are in the heart of North Carolina's Pisgah National Forest. We access incredible trails from out our back door. You don’t have to ride bikes to fall in love with The Bike Farm. If you love the outdoors you've come to the right place. 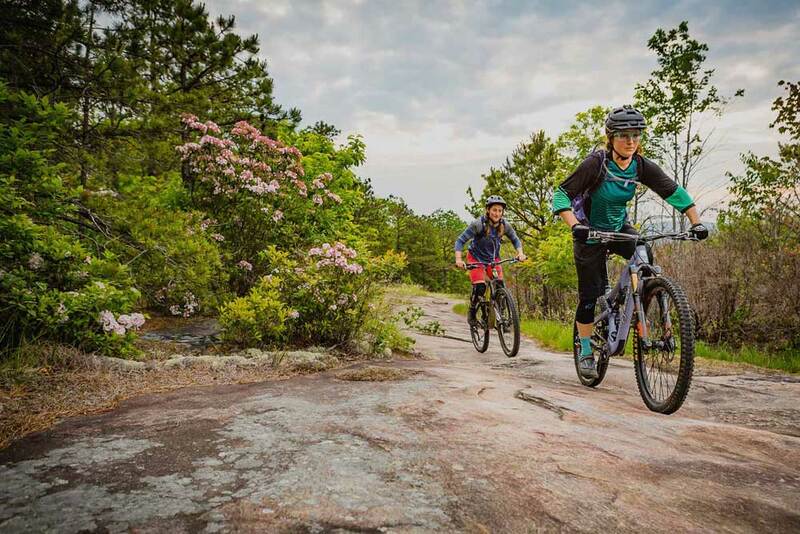 The Bike Farm is here to show you the best mountain biking in western North Carolina. We provide half, full, and multi day guided rides custom tailored to an individual or groups abilities, desires, time, and budget. All trips are private, so you will never be put with another group. The Bike Farm team will create a customized program based on the individual or groups abilities, desires, time, and budget. Whether you are a beginner looking to learn the basics or a seasoned rider looking to break through to the next level our coaches can help you reach your goals. Imagine waking up in a real bed, taking a warm shower and sipping your morning coffee on the back porch of your own private deck. Our unique four-season tents offer a comfortable night stay whether you’re biking with us or choosing your own adventure. Our fully-featured tents include lighting and electricity. Hot water showers and porta potties are only a few steps from your front porch. Staying at The Bike Farm is the best way to enjoy the Pisgah National Forest whether you’re biking with us or choosing your own adventure. We have camp sites of different sizes and varieties including elevated deck camping, convenient car camping or secluded forested camping. Whichever site you choose, you’ll have access to hot showers, porta potties, drinking water and of course…private trails. Peace of Adventure partners with The Bike Farm to offer multi-day mountain biking clinics for participants of all abilities. With basecamps in Brevard, North Carolina and Snowmass, Colorado, the Recovery Ride program is dedicated to veterans and civilians with disabilities together as one unit learning new skills and overcoming life’s obstacles. After challenging yourself on a bike, you’ll relax in a fully accessible ‘glamping’ environment and share in meaningful conversation around the fire.